It is a very great pleasure to be able to share this description and photographs of Aleksei Kryukov's exacting build and beautiful model of Capt Yukiyoshi Wakamatsu's Ki-44-II Ko “Shoki” from the Hasegawa 1/48th scale kit in the first of a two part article courtesy of Iskender Mailibayev who also kindly provided the English translation. "The Ki-44 kit produced by Hasegawa in 1/48th scale cannot be considered well detailed or very accurate by modern standards, but nevertheless can be built into a beautiful model. 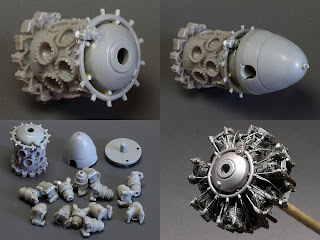 I should start by saying that the construction process in general was hampered by the lack of information, especially on such important (from a modeler’s point of view) areas as the engine, cockpit and wheel wells. A fellow modeler, Iskender Mailibayev, shared available information on a Shoki. Vector 48019 Sakae – 11/12 / Ha-25 engine (needs some conversion, to be discussed later). "I chose the paint scheme of Yukiyoshi Wakamatsu’s Ki-44-II Ko from 85th Sentai. It should be noted that the kit instructions suggest a single color for the upper surfaces, whereas surviving photos and color profiles in several publications show a two-color application. Also the hinomaru on the actual plane were slightly different in size from the kit supplied decals. 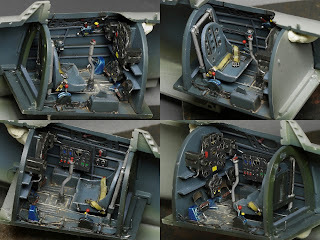 "Construction required certain modifications which can be generally grouped into cockpit, engine, wheel wells and landing gear. cables and rods imitated with thin wire; several parts were scratchbuilt; resin seat was used. 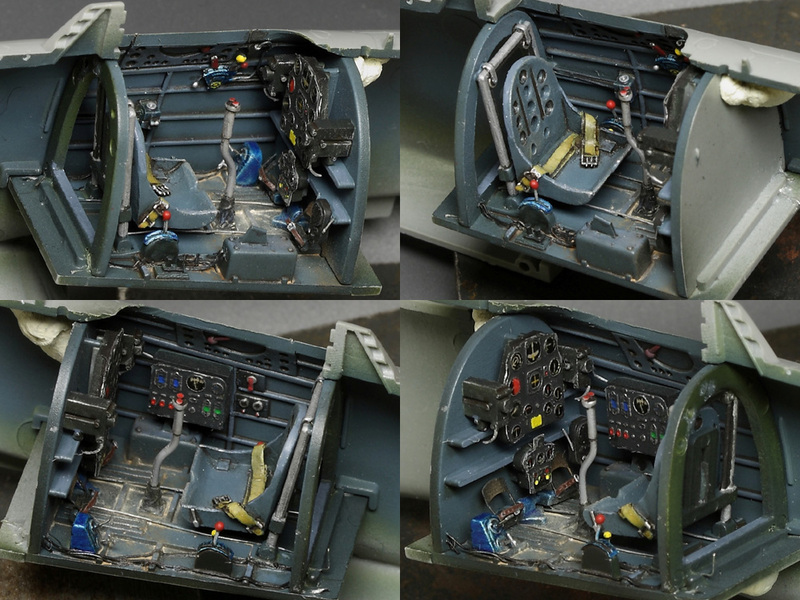 Following recommendations the cockpit was painted dark blue-gray #3 (Hai-ai-iro). The color is a mix of Tamiya XF-18 (Medium Blue), 19 (Sky Grey) and 8 (Blue). After painting smaller details (black, metal, aotake), the surface was toned down with oil, followed by minor silver dry brushing, gloss coat, wash, flat coat and some Mig pigments on the floor surface. Maintenance holes were drilled in places already marked on the kit and in additional areas. Holes also had to be drilled in the well side walls. The holes on the front walls didn’t turn out the way I wanted, so I covered them with round panels (similar to Ki-43). Plastic around the holes was thinned on the inside to look more to scale. Pictures of a Ki-44 centresection wreck on display in China show that some holes inside wheel wells were covered by panels (rectangular natural metal color patches visible on the aotake coat around the holes). I decided not to cover all holes with panels, but to leave some of them open (randomly), painting natural metal rectangular patches in place of the “removed” panels. Rear walls were detailed with some plastic ribs and wiring. "To be continued . . . "
Well, that is one beautiful model of a beautiful airplane! The colors used on the exterior and finish are superb. Wow!! Wonderful!! Every time I look ata a Shoki, more I like it. I didn´t know that Shoki interiors were blue. Stunning display of the modeler's art at it's best! Bravo. Fabulous work Aleksei, and a useful guide for others. There is an after market resin Ha-109 engine set available in 1/72nd and 1/48th scales. The Engines & Things stock numbers are 72167 and 48132. Neither will be as detailed as the Vector example modified for use on your fine model. I have several E&Ts for use on 72nd scale projects, none requiring the last word in super detailing, as you have accomplished with your excellent build.